Recent posts have grappled with the interesting topic of phase transitions in physics (link, link, link). One reason for being interested in this topic is its possible relevance to the social world, where abrupt changes of state in the social plenum are rare but known occurrences. 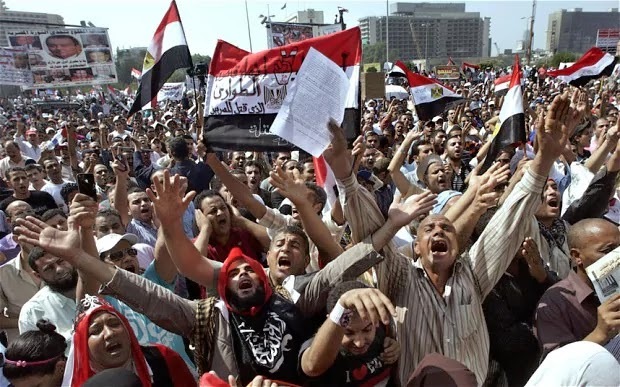 The eruption of protest in numerous countries across the Middle East and North Africa during the Arab Spring is one example. Essentially we can describe these incidents as moments when ordinary citizens are transformed from quiescent members of civil society, pursuing their private lives as best they can, to engaged activists assembling at great risk in large demonstrations. Is this an example of a phase transition? And are there observable indicators that might allow researchers to explain and sometimes anticipate such critical points? There is a great deal of interesting research underway on these topics in the field of complex systems and communications theory. The processes and phenomena that researchers are identifying appear to have a great deal of importance both for understanding current social dynamics and potentially for changing undesirable outcomes. Researchers on the dynamics of mass social media have addressed the question of critical transitions. Kuehn, Martens, and Romero (2014) provide an interesting approach in their article, “Critical transitions in social network activity” (link). Also of interest is Daniel Romero’s “An epidemiological approach to the spread of political third parties”, co-authored with Christopher Kribs-Zaleta, Anuj Mubayi, and Clara Orbe (link). A large variety of complex systems in ecology, climate science, biomedicine and engineering have been observed to exhibit tipping points, where the dynamical state of the system abruptly changes. For exam- ple, such critical transitions may result in the sudden change of ecological environments and climate conditions. Data and models suggest that detectable warning signs may precede some of these drastic events. This view is also corroborated by abstract mathematical theory for generic bifurcations in stochastic multi-scale systems. Whether such stochastic scaling laws used as warning signs for a priori unknown events in society are present in social networks is an exciting open problem, to which at present only highly speculative answers can be given. Here, we instead provide a first step towards tackling a simpler question by focusing on a priori known events and analyse a social media data set with a focus on classical variance and autocorrelation warning signs. Our results thus pertain to one absolutely fundamental question: Can the stochastic warning signs known from other areas also be detected in large-scale social media data? We answer this question affirmatively as we find that several a priori known events are preceded by variance and autocorrelation growth. Our findings thus clearly establish the necessary starting point to further investigate the relationship between abstract mathematical theory and various classes of critical transitions in social networks. 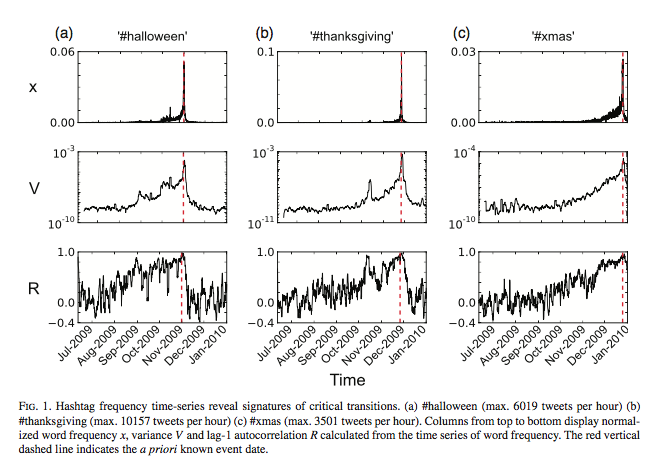 Below are the data they present showing statistical associations of hashtag frequencies for impending known events — Halloween, Thanksgiving, and Christmas. The X panels represent the word frequency of the hashtag; the V panels represent the variance, and R represents autocorrelation on the time series of word frequency. How do we define when a critical transition occurs in the data for an a priori unknown event? For a priori unknown events, is there a possibility to identify hashtags or other aspects of the message which allow us to determine the best warning sign? Can we link warning signs in social networks to a priori unknown critical transitions outside a social network? Which models of social networks can re-produce critical transitions observed in data? Abstract. Third political parties are influential in shaping American politics. In this work we study the spread of a third party ideology in a voting population where we assume that party members/activists are more influential in recruiting new third party voters than non-member third party voters. The study uses an epidemiological metaphor to develop a theoretical model with nonlinear ordinary differential equations as applied to a case study, the Green Party. Considering long-term behavior, we identify three threshold parameters in our model that describe the different possible scenarios for the political party and its spread. We also apply the model to the study of the Green Party’s growth using voting and registration data in six states and the District of Columbia to identify and explain trends over the past decade. Our system produces a backward bifurcation that helps identify conditions under which a sufficiently dedicated activist core can enable a third party to thrive, under conditions which would not normally allow it to arise. Our results explain the critical role activists play in sustaining grassroots movements under adverse conditions. Their approach makes use of a system of differential equations to describe the behavior of the population as a whole based on specific assumptions. It would seem that the problem could be approached using an agent-based model as well. This paper is relevant to the general topic of critical points in social behavior as well, since it attempts to discover the conditions under which a social movement like third-party mobilization will accelerate rather than decay. Abstract: Must the Internet promote political fragmentation? Although this is a possible outcome of personalized online news, we argue that other futures are possible and that thoughtful design could promote more socially desirable behavior. Research has shown that individuals crave opinion reinforcement more than they avoid exposure to diverse viewpoints and that, in many situations, hearing the other side is desirable. We suggest that, equipped with this knowledge, software designers ought to create tools that encourage and facilitate consumption of diverse news streams, making users, and society, better off. We propose several techniques to help achieve this goal. One approach focuses on making useful or intriguing opinion-challenges more accessible. The other centers on nudging people toward diversity by creating environments that accentuate its benefits. Advancing research in this area is critical in the face of increasingly partisan news media, and we believe these strategies can help. This research too is highly relevant to the dynamic social processes through which largescale social changes occur, and particularly so in the current climate of fake news and deliberate political polarization.